Spring bulbs are a saving grace after a long winter. Ipheion spring starflowers are small flowering bulbs from South America. They spice up the garden with onion scented leaves and white star-shaped blooms. That said, growing spring starflowers in containers is just as easy and creates just as much impact. 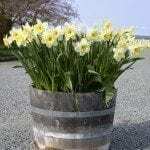 The key is having the appropriate container, good soil and knowledge on how to plant Ipheion bulbs in pots. Spring starflower bulbs need to be installed in fall so they can experience dormancy and chilling periods that force the embryonic plant to emerge when temperatures warm. As the bulbs mature, they will produce bulblets and new growth in successive years. As a South American native, Ipheion thrives in warm temperatures and full sun. While the bulbs are hardy to United States Department of Agriculture zone 5, many people enjoy growing starflowers in containers, especially those in colder climates. Spring starflower bulbs can achieve 6 to 8 inches in height and are topped with 1-inch wide white flowers with 6 petals. Ipheion is a relative of the onion, which explains the scent of its leaves when crushed. Bloom time is February to April but, occasionally, a late bloomer will appear. Good drainage is the most crucial need for Ipheion bulbs in containers, as well as the ground. You’ll need a container large enough to accommodate the number of bulbs planted and one that provides adequate drainage. Choose a mixture of peat and loam for the planting medium. Install bulbs 2 to 3 inches deep with the pointed side upward. Incorporate bone meal or a good bulb food at planting for best growth. 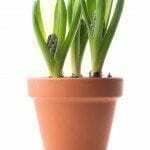 When you plant Ipheion in containers, keep pots moderately moist until you see the first sprouts and thereafter water when the top inch of soil is dry. Allow the foliage to persist even after the flowers have stopped appearing so the plant can gather solar energy to store for the next season’s growth. If you live in a cool zone, it is recommended that you bring in the containers to overwinter. Let foliage die back and place pots in a cool, dark, dry area. Alternatively, you can remove the bulbs in fall, allow them to dry for a few days and place them in a mesh bag with peat moss. Store the bag where it is cool and dry and plant the bulbs as soon as soil is workable in spring. Read more articles about Ipheion Starflower.